A 51-YEAR-OLD businesswoman who is a a casino financier was robbed at gunpoint by five men inside her house in Barangay Bankal, Lapu-Lapu City on Sunday. According to the police, a personal grudge is being investigated as the possible motive of the lone biker for shooting a 15-year-old girl and her mother who were aboard a public utility jeepney along A.S. Fortuna Street, Barangay Banilad, Mandaue City Saturday afternoon. 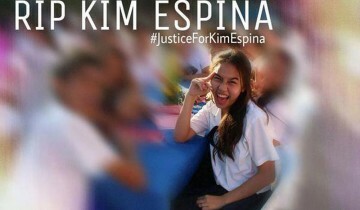 Relatives, classmates, and friends of Kim Espina, the 15-year-old who was gunned down on board a jeepney along A.S. Fortuna St., start social media campaign asking #justiceforKimEspina. Joy Chan, 27, who owed businesswoman Marites Amit P500,000, was a guest at Amit’s house. She was suspected to have left open the gate, main door and door to Amit’s room to allow entry of four accomplices. About four hours after the robbery in the Deca 4 Subdivision, a team of Alcoy policemen arrested five persons in Oslob, around 120 kilometers south. Senior Police Officer 2 Marcos Noval Jr. of the Investigation and Detective Management Branch of the Mandaue City Police Office said that they are currently looking into a personal motive of the suspect for shooting Kim Espina, a high school student who died on the spot after getting shot in her head and her mother Prescilla Espina who was taken to the Vicente Sotto Memorial Medical Center (VSMMC) in Cebu City. Noval discounted the possibility that the shooting could have been related to the alleged involvement of Prescilla’s son, Tibor, in illegal drugs. Tibor was arrested on the first week of January this year for his alleged illegal drug activities. The victims often visited Tibor while he was still detained in the station. Noval admitted that they do not have any leads yet on the identity of the suspect. Kim succumbed to a gunshot wound on her neck and was pronounced dead on arrival at the Gullas Medical Center while Prescilla is already in stable condition but is still recuperating at VSMMC after she was shot near her right eye.